Adrian Butterfield is a violinist, director and conductor who specialises in performing music from 1600–1900 on period instruments. He is Musical Director of the Tilford Bach Society and Associate Director of the London Handel Festival and regularly directs the London Handel Orchestra and Players as well as working as a guest soloist and director in Europe and North America. The London Handel Players perform regularly at the Wigmore Hall and throughout Europe and North America and their Handel recordings have received glowing reviews. The Revolutionary Drawing Room specializes in classical and romantic music on period instruments and has also performed in North America and Europe. A new recording of quartets by Haydn, Mozart, Vanhal and Dittersdorf will be released in the autumn of 2014 and RDR will be celebrating their 25th anniversary in 2015. Other recent CD releases include Mozart’s Clarinet Quintet with Colin Lawson on Clarinet Classics and Geminiani’s Op.1 sonatas (SOMM) in 2012. Adrian’s world premiere complete recordings of Leclair’s Books 1 and 2 violin sonatas were released in 2009 and 2013 on Naxos Records. 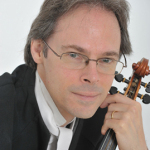 He works annually with the Southbank Sinfonia, is Professor of Baroque Violin at the Royal College of Music in London, gives masterclasses in Europe and North America and teaches on the Aestas Musica International Summer School of Baroque Music and Dance in Croatia. Recent highlights have included conducting the LHO in Bach’s B Minor Mass, St. John Passion and Magnificat at Tilford and Handel’s Israel in Egypt at St. George’s, Hanover Square and La Resurrezione at the Wigmore Hall, directing the London Mozart Players in Bach and Mendelssohn and appearing on Croatian Television with LHP as well as appearances at the Brighton, Gregynog, Kings Lynn and Buxton Festivals. Plans for the 14/15 season include a number of projects in Canada, LHP’s debut at Carnegie Hall and the Halle Handel Festival as well as a return to the Wigmore Hall, a return to direct a project with the Croatian Baroque Ensemble in Zagreb and an appearance at the Greenwich Early Music Festival. RDR’s 25th anniversary celebrations will open with concerts for the Tilford Bach Society and at St. John’s, Smith Square. The Tilford Bach Festival next June will feature a performance of the St. Matthew Passion with one singer per part.